Hi there, so much to report since the last update. 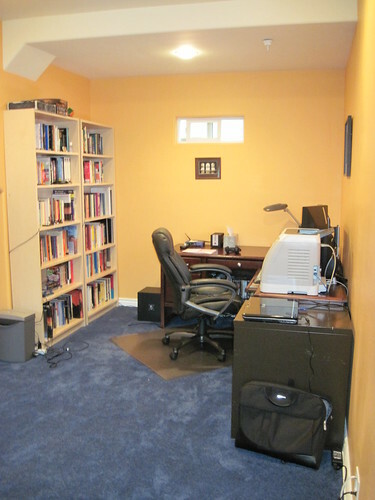 First, we had the single-car garage (which was being used as a junk storage space) converted into my office/cave. The contractors did a really good job for less than we were expecting. I uploaded some flickr photos of my new cave. You can also see that I got a new monitor, a Dell U2410. I flipped my other monitor to portrait mode for the extra height for text applications. Next, mini-Elbeno and I took a trip to London! (Leaving Mrs Elbeno and micro-Elbeno at home). We had a flying visit (Thursday to Tuesday) for my sister’s wedding. It was great to see all the family and have a good time. The chap dealt pretty well with jet lag, and we just took things at our own pace as far as bedtimes. Of course we were partying the night of the wedding and in general the jet lag worked in our favour, keeping us up into the night. The ceremony itself was pretty traditional Anglican: 1 Corinthians 13, Pachelbel’s Canon and Ave Maria all made appearances; and I’m sure ministers are required by law to start by saying that Jesus was a guest at a wedding (in Cana). Mini-Elbeno was the ring-bearer and I ushed, which gave me a good chance to hobnob with old friends and fam. While in Blighty, we also got to visit some old friends in Brighton, ate fish and chips and “proper” Indian food, and finally met my brother’s GF who we’d only seen before on the webcam. The flights were long of course but we got by with the in-flight entertainment (e.g. Outnumbered and Playhouse Disney) and the food was actually edible, even quite good! Air New Zealand – would fly again. Soon after we got back, the next event was the school social: the annual get-together and campout that mini-Elbeno’s school does. Each family is invited to do a short skit, presentation or similar to tell everyone about themselves and what they did over summer. Our chosen effort (old movie fans that we are) was a rendition of Make ‘Em Laugh, that tour de force from Donald O’Connor in Singin’ in the Rain. Here’s our take on it. That’s about all I have to bring you up to speed on today except to mention that it’s October again and that means the Interactive Fiction Competition is underway. I’m enjoying the first one I tried although it went in a different direction than I first expected. More soon. Blizzcon is nearly upon us, and it’s going to be awesome. Plus, I have a special keyboard coming to me by mail; I’ll let you know all about it when it arrives. This entry was posted on Saturday, October 2nd, 2010 at 8:35 pm	and is filed under Games, Travel. You can follow any responses to this entry through the RSS 2.0 feed. You can leave a response, or trackback from your own site.